If you love knitting and you have a baby on the way or very young children then this is the book for you. Absolutely brimming with the most adorable and practical patterns I’ve seen in a long time I’ve now got several orders for things. My favourite though has to be the penguin bottle warmer and carrier which must be the cutest thing I have ever seen! One of the great things about this book is that it is really clearly laid out, the instructions are well written and there seems to be a range of patterns for all abilities. I thought the technique section was quite useful. At the moment my major gripe with knitting books is that they are too large. The main culprit in my bookshelf and knitting bag is the Rowan Knitting and Crochet magazine which is like lugging around a large brick. Thats where a knitting book like this one really comes into its own as it has everything you need including really good photographs (something I find useful to refer to). This book has been cleverly considered to take the reader on a journey through a zoo and each chapter is a different zone in the zoo which makes for a delightful visual journey. If you are looking for patterns for young children then this is one of the best knitting books i’ve seen in a while, lots of original and unique designs some of which can be knitted up really quickly and some which provide longer projects. 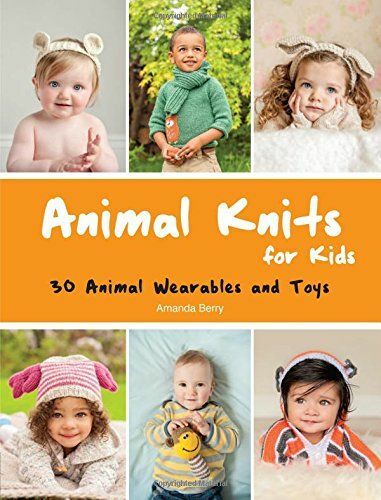 You can get hold of a copy of animal knits for kids here.